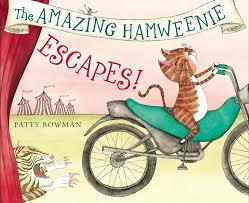 Children's Book and Media Review – The Amazing Hamweenie Escapes! Hamweenie the cat knows exactly what he wants, thank you very much. What some would call a posh existence is not at all up to Hamweenie’s liking, and he’s determined to do something about it. His quest for fame and adoration leads him to escape and join the circus, where he has some hilariously misinterpreted encounters with the residents of New York City and, later, the animals in the circus troupe. Eventually, Hamweenie’s five minutes of fame pass and he is once again in captivity. The change of venue does not stop Hamweenie though, and he continues to perform—right in his own living room. The character of Hamweenie is that of humorously ungrateful precociousness. Author Patty Bowman captures the feline spirit in Hamweenie’s one track interest in his stardom and indignant misinterpretation of his owner’s loving care, which he views as controlling and abusive. There is something likeable and endearing about Hamweenie, though he is grouchy and entitled in a way only cats can be. The pen and ink illustrations are uniquely detailed, throwing into sharp relief the many teeth of a tiger, the curls of Hamweenie’s whiskers, and the comically skewed brand name references scattered throughout the book. The Amazing Hamweenie Escapes! is best suited for a preschool and young primary audience, since it relies on readers’ close attention to the illustrations combined with the text to catch the contradictions in Hamweenie’s perceptions versus his reality.